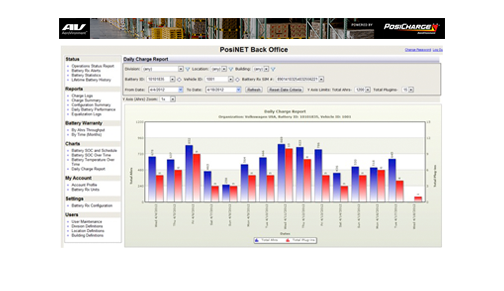 The PosiCharge™ PosiNET is a comprehensive battery management tool that produces accurate, real-time information for maximizing electric forklift fleet performance. PosiCharge™ PosiNET is a comprehensive fleet management tool for fast charge operations. Built on a unique system architecture that links all fast chargers into a single network, PosiNET automatically captures and analyzes operational data, and then presents actionable fleet usage and warranty compliance reports, thereby empowering operations professionals to manage their fleet effortlessly. Detailed daily tracking reports, weekly exception reports and lifetime statistical analysis provide easy visibility to battery health across the entire fleet, helping identify potential issues before they become larger problems and simplifying warranty compliance. Historical and predictive reports provide concrete information for training your operators, optimizing the distribution of vehicles throughout your facility, and planning for future orders or expansions. Real time views of your fleet allow you to immediately identify compliance problems, explore causes, and provide on-the-spot guidance to your operators. 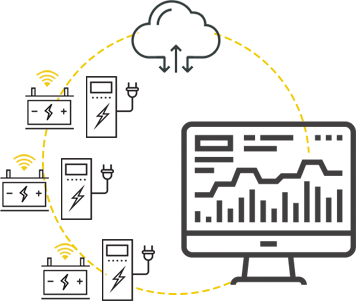 Charger and battery data are automatically downloaded from the charger and uploaded to the PosiNET Data Center for processing. No manual download procedures are required. Twenty-five pre-defined reports are available without even touching a button. Scheduled weekly, monthly or annual reports on fleet activities are sent directly to any Internet-accessible email account. User- level filtering provides only the most useful reports based on user roles and responsibilities. Web-based system architecture allows access to operational information from any place in the world. Simple, intuitive controls allow the user to rapidly navigate to the information they need. Optional third-party access to fleet data can dramatically improve service response time. Battery and charger service personnel can review data in order to identify issues, remotely diagnose, and provide fast solutions, minimizing downtime and maximizing productivity.